ALS Research Forum | Sluggish Mitochondria Not Causing Withered ALS Axons After All? Sluggish Mitochondria Not Causing Withered ALS Axons After All? Mitochondria hobble along the motor neuron axons as those axons degenerate in amyotrophic lateral sclerosis—yet the limping organelles and the dying back of the axons are discrete events, according to a report February 27 in the Proceedings of the National Academy of Sciences online. Examining three genetic mouse models for ALS, the study authors determined that, while the mitochondria dally before axons shrivel in the most commonly used lab mouse, in another model the axons succumb even while mitochondria still bustle along unaffected. Previous research suggested mitochondrial transport deficits might kick start ALS pathology. The report provides an important lesson, said senior author Thomas Misgeld of the Technical University Munich, Germany, in that scientists must examine several ALS models to obtain a complete story about pathology. The work is well done, commented Giovanni Manfredi of the Weill Cornell Medical College of Cornell University in New York City, but he questioned the interpretations. Just because axonal degeneration does not follow hot on the heels of mitochondrial defects does not mean the two are unrelated, said Manfredi, who also works on mitochondria in ALS (see ARF related news story). Neuron death is likely the result of small insults having built up over time, Manfredi said, and mitochondrial problems could still be one of those insults. Misgeld and others noted that mitochondria are but one among many kinds of axonal cargo that might be affected in this disease. “Transport disturbances in ALS are by no means ‘out’ by our study,” Misgeld said. “We cannot generalize…;for all cargoes.” Misgeld led the work with co-senior author Martin Kerschensteiner of Ludwig Maximilians University Munich and first author Petar Marinkovic at Technical University Munich. Altered axonal transport has been linked to several neurodegenerative conditions (see ARF related news story; De Vos et al., 2008), including Alzheimer’s (see ARF related news story on Stokin et al., 2005), Huntington’s (see ARF related news story on Szebenyi et al., 2003), and ALS (De Vos et al., 2007). “However, whether the abnormal axonal transport is a cause, a contributing factor, or simply a consequence of the neuronal pathology is still an open question,” wrote Virgil and Zoia Muresan of the University of Medicine and Dentistry of New Jersey in Newark in an e-mail to ARF (see full comment below). Marinkovic and colleagues addressed the question in model mice overexpressing the human ALS gene superoxide dismutase 1. “Considering the body of previously published data—strongly suggesting that the transport of mitochondria deteriorates prior to neurodegeneration and likely causes the synaptic alterations in motor neurons—their results are somewhat surprising,” the Muresans wrote (see ARF related news story on Magrane et al., 2012). Misgeld, Kerschensteiner, and colleagues followed mitochondrial dynamics in neuron preparations from live mice (Misgeld et al., 2007). Marinkovic explanted chest muscle, along with its attendant nerves, for study under the microscope. He crossed the mSOD1 mice with a line carrying a transgene driving expression of a fluorescent protein in neuronal mitochondria. The photo-convertible marker, called Kaede, starts out emitting green but changes to red when hit with violet light. By converting a few mitochondria to red, Marinkovic could watch their progress as they traveled in a sea of green peers. First, Marinkovic examined mitochondrial trafficking in the popular SOD1-G93A model. These mice tend to exhibit denervation of muscles and clinical symptoms around three to four months of age. As seen by other researchers (Bilsland et al., 2010), transport defects arose first—before the animals reached three weeks old, Misgeld said. 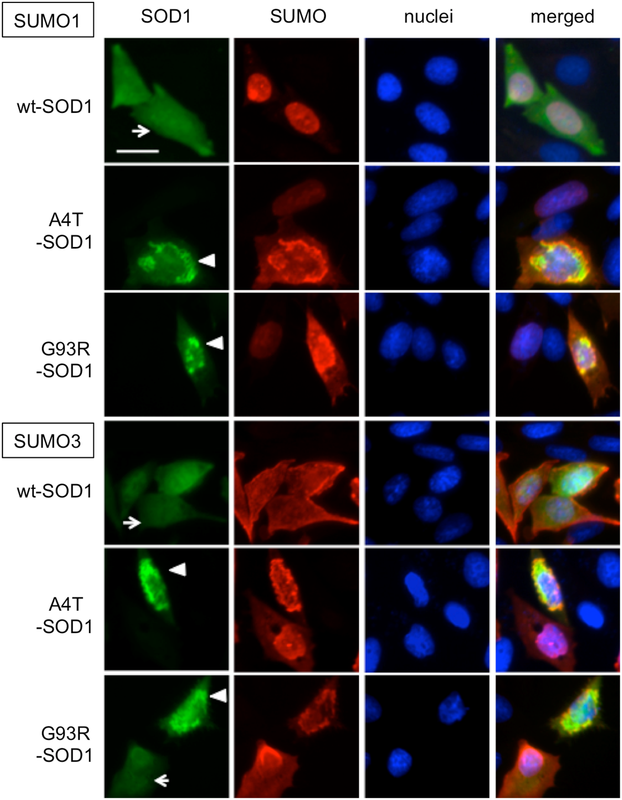 Compared to mitochondria from wild-type control mice, the SOD1-G93A organelles moved more slowly, paused more often, and stayed put for longer periods. The results were similar for another model, SOD1-G37R mice. There are two possible interpretations of these results, Misgeld said. For one, it might be that the negative effects of the mitochondrial transport defect build up, over months, to a point when the axons finally shrivel. Alternatively, he said, perhaps the two events are not closely related after all. To investigate further, the scientists repeated the experiment in SOD1-G85R mice. These mice survive for nearly a year. The team was surprised to see that mitochondrial traffic patterns remained mostly normal even up to the age the animals were near death. This suggested to them a transport defect could not be causing the neurodegeneration. Finally, Marinkovic analyzed mice overexpressing wild-type human SOD1. When he tracked mitochondria in these animals, their motion was impaired as early as two months of age, much like that of the SOD1-G93A mitochondria. But the SOD1-WT mice did not exhibit the axon dying-back seen in the G93A model; mild axon degeneration was not noticeable until one year of age. Hence, mitochondrial traffic and axon degeneration showed no consistent relationship across the three mouse models. Misgeld and colleagues thus concluded that the meandering mitochondria and expiring axons were separate events. Manfredi said he had seen similar results in his lab. Even so, the idea that “one event should follow another one in rapid sequence is obviously not the case with neurodegeneration,” he said. Instead, he suggested mitochondrial traffic jams could be one among many “hits” that build up over a lifetime before an animal, certainly a person, succumbs to a disease such as Alzheimer’s, Parkinson’s, or ALS. The G85R mutant is also a rather odd member of the mSOD1 mouse family, he noted, in that it expresses only low levels of an unstable protein and the mice tend to remain healthy for most of their lifespan, only sickening approximately one week before death (Bruijn et al., 1997). Even though work from Manfredi’s lab has repeatedly correlated mitochondrial transport deficits with ALS (see ARF related news story on Igoudjil et al., 2011), “I am not 100 percent sure that mitochondrial abnormalities are the cause of disease,” he said. Manfredi and Weill Cornell colleague Jordi Magrane are working on stunting the organelle’s traffic in the neurons of animals that are otherwise normal, an experiment they hope will settle the question. Scott Brady of the University of Illinois in Chicago, who studies axonal transport in neurodegeneration, said the data were solid but the results were limited in scope since mitochondria are only one type of axonal traveler. “A defect in one set of cargo does not necessarily produce a defect in another,” he said. “Mitochondria are not typical in terms of how they move,” Brady added. The Muresans explained that mitochondria spend more time stationary than in motion; when they do travel, it tends to be over short distances, and they frequently reverse direction. Misgeld concurred, noting that other researchers have suggested slowed transport of other cargoes, such as tubulin, could contribute to ALS pathology (Williamson and Cleveland, 1999; Collard et al., 1995). “I think we have a lot more to learn about this link between transport and degeneration,” Misgeld said.